The word hedonist is defined by Merriam-Webster as”…the doctrine that pleasure or happiness is the sole or chief good in life.” Being a Foodie sort of falls into the category of being a Hedonist, don’t you think? 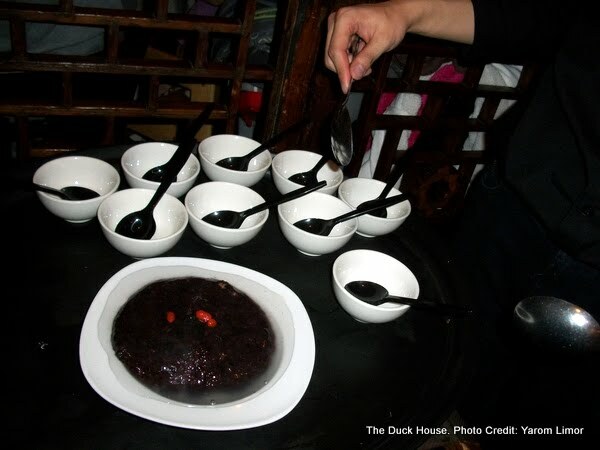 Anyway, a few days ago I dined with a group of Hedonist at The Duck House; a restaurant that is also known by it’s Chinese name, Lu Din Gee Cafe. I knew nothing more about The Duck House other than listening to the personal experiences from a few close Foodie friends. Getting to the restaurant was a freakin’ hassle, but it usually is the case in rush hour L.A. traffic. When I arrived, I found a friend of mine outside. We brought our wines to share with the rest of the Hedonists. We were greeted with quite hospitably and escorted to our table. To my surprise, a plate of roasted duck wings and feet parts welcomed us at the dinner table. I actually enjoyed gnawing on these morsels. It was like the movie trailer to what we’re in store for. The duck nibbles were smoky and not like a gummy dim sum chicken feet. Within minutes, the rest of the dining group showed up including our Head Banging, Poker Playin’ Leader. A friend brought a 2005 Cabernet Sauvignon from Cobblestone Vineyards in Napa, California. I, on the other hand, brought a 2006 Rieussec Sauternes, which I figure would be great with whatever dessert that the group decides to eat. In all, our table was cluttered with eight bottles of premium wines. Another friend sweet talked our Server in Chinese about the corkage fee. She scored us a $5 corkage fee for each bottle. It was a sweet deal for a bunch of Oenophiles! The only thing that ran through my mind was ordering an extra Peking Duck with the money that we just saved. 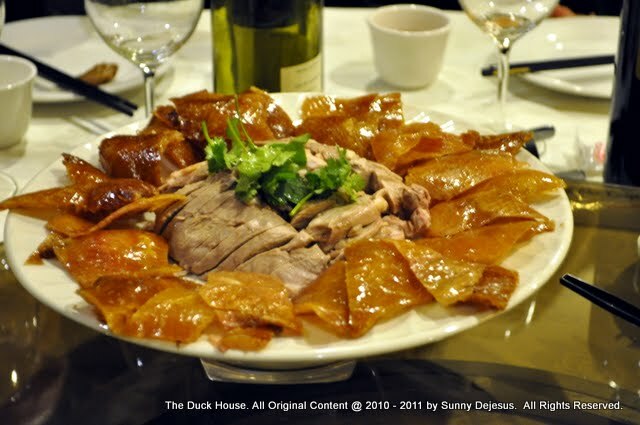 The roasted Peking Duck meat almost tastes like it’s poached or bathed. The texture of the meat is incredibly juicy and tender. I had envisioned that our duck would be served with a steamed pancake. 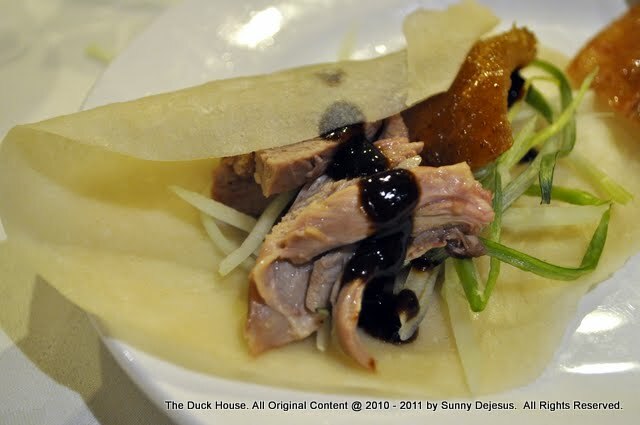 Instead, The Duck House serves their Peking Duck with crepes; fresh, thin, fragile crepes served in one of those tortilla containers that you find in a Mexican Restaurant. I was a little skeptic about the crepes, because I fancy the steamed pancakes. I arranged my meal on my plate. Crepe, scallion, some julienned cucumbers, wafer thin-crispy duck skin, and the meat. Drizzle a little Hoisin Sauce and carefully fold. Then lift and take a bite. Oh man! It’s good! Batter on first base. Soon the rest of our orders spilled out of the kitchen. I wasn’t exactly fond of the Angel Hair Shrimp. 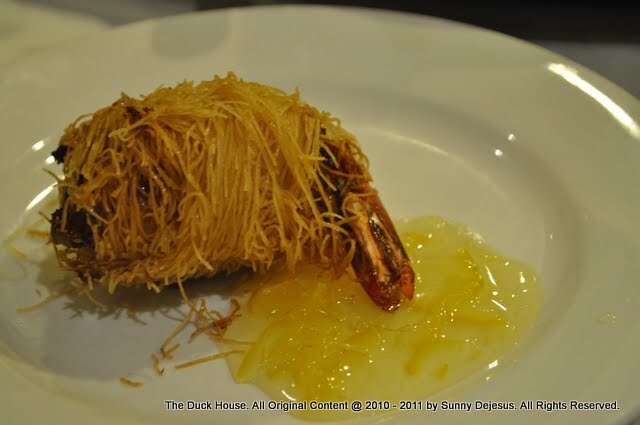 The “Angel hair”, made out of thinly sliced Filo dough, was flavorless. The shrimp was over-cooked and a little leathery from the frying process. I loved the concept of having a lemon marmalade dipping sauce, but it’s flavor was way to delicate to accompany a fried food. This this dish is definitely a first strike. 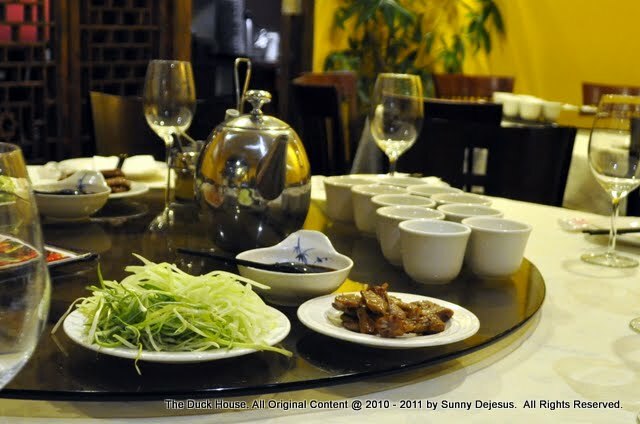 Could the Peking Duck be the only home run at the Duck House? Things got a little better or maybe it’s because I started to feel the effects of five one ounce pours from our selection of eight wines. Just kidding! Actually, the heavy hitters started coming out of the dugout. Treasure Island is one of those dishes that looks complex to make, but is simple. As a matter of fact, it’s delicious. It’s a beautifully stewed Napa cabbage dish with the guts of the fatty substance that one would find in a head of a crab in a sea of seafood gravy. I ain’t talkin’ brains parts. Those of you familiar with eating a steamed crab, it’s the good stuff. You’ll know it when you see it. Anyway, what I also like about this dish is the appearance. It just just reminds me of that dish that Iron Chef Chen made on the original Japanese version of Iron Chef. Finally, we got to second base! As for the Filet Mignon Cubes. Black pepper spice sauce, garlic and onions stir fried with Filet Mignon. This dish certainly wasn’t boring. It was so incredible that we placed a second order to make sure that we got more than enough of it. Ah ha, third base! Holy smokes! Okay, it’s still bottom of the 12th inning and all bases are loaded. The Taiwanese Style BBQ Eel on Sticky Rice took forever to come out the batting cage. I love this dish, because it looks so freakin’ gorgeous pictured on menu. It’s even better hot out of the kitchen. It’s soy sauce soaked rice steamed in a bamboo steamer lined with banana leaves that gives the rice a subtle earthy robust flavor. This dish becomes a meal in itself when the eel cooks and the juices falls on top of the rice. 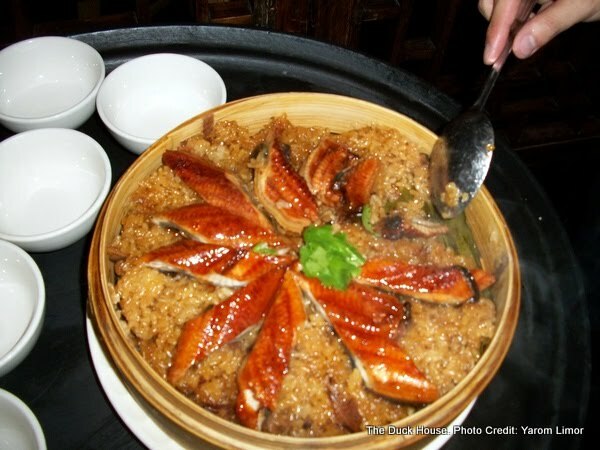 Please don’t confuse this dish with its Japanese version, Unagi Rice. The Tawainese version is much, much better. 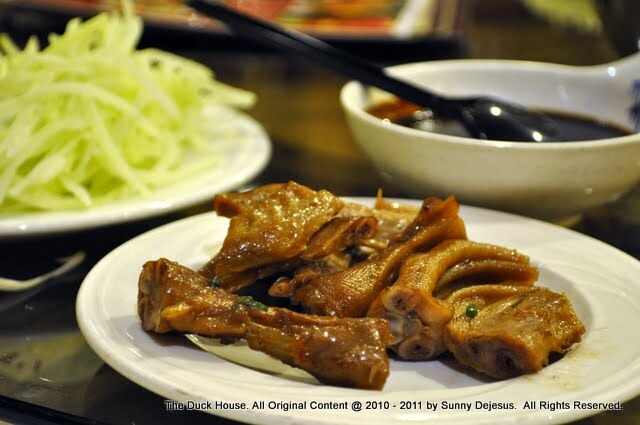 My friend tole me that this dish is a very traditional Taiwanese dish and that The Duck House makes it the best. She was right! This dish was fantastic! Swing and hit. We got a home run! Whoooo hoooo! The wines we brought were surprisingly good with the Chinese food ate. Most were California Pinot Noirs. The 2006 Rieussec Sauternes, a French wine, a nice grapefruit and honeysuckle overture what tasted brilliant after a heavy meal. Shockingly, it also paired well with the Chinese sweet rice dessert called Sweet Lotus Sticky Rice and the Passion Fruit flavored Konnyaku; a gelatin. In all, the dinner with a bunch of Hedonist was a memorable dining experience. However, the food at the Duck House is a hit or miss. Stick to my recommendations and you’ll find your dining experience satisfying.